Product categories of Different Type Generator, we are specialized manufacturers from China, Diesel Standby Generator, Commercial Generators suppliers/factory, wholesale high-quality products of Prime Power Generators R & D and manufacturing, we have the perfect after-sales service and technical support. Look forward to your cooperation! Huali open type gen-set have simple construction,save space,easy maintenance. Where every your team travels, tow our mobile gen-set with you to conquer any of the toughest environment, working condition from -10`C to 50`C. It`s reliability and mobility makes you confidence and convenient to tow power to anywhere at anytime. 1.Manufacture and design gen-set`s container according to ISO container standards, gen-sets below 1250kva adopt 20ft container and above 1250kva adopt 40`ft container. 2.Container with CSC/CCS certificate, the complete containerized gen-sets can be directly carried by Cargo ship. 3.Huali container is painted with high stiffness and anti-rusty polyurethane paint; also the chose of shape stainless steel makes it superior mechanism structural quality compare to ordinary container. 4.Two anti-explosion led lights fixed inside of container and control panel, design for maintenance and operation. 5.Front and back doors, two side doors and ladder on each side, designed for easier access and maintenance. 6.Huali container gen-set is patent for its oil/water/diesel leakage free and recycling system. 7.All hinges, locks, screws are stainless steel, inside of the container fixed with anti sea water/rainproof accessories. 8.Fix with control panel and output panel. 9. 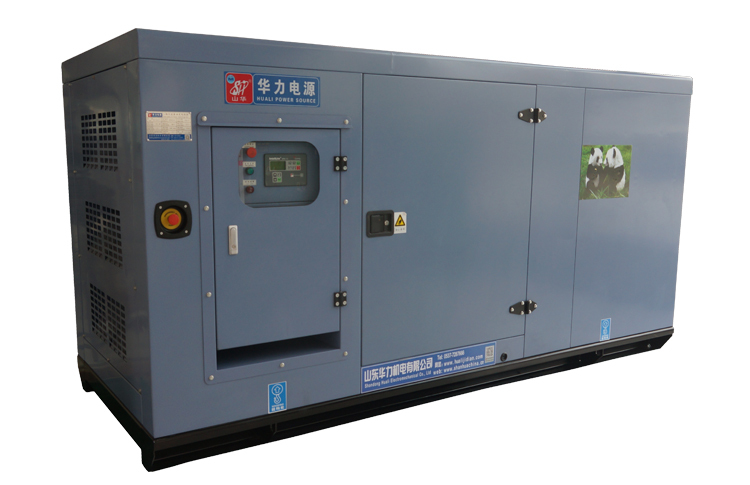 FIX PMG (Permanent magnet Generator) as standard, which ensure the gen-sets, can be started easily and offer stable power. 10.Huali designed Fuel tank. Fuel supply drains, external auto refuelling outer joint, and muffler, etc, are well appreciated by our clients. 11.Our high performance soundproof material is durable, efficient and flameproof.